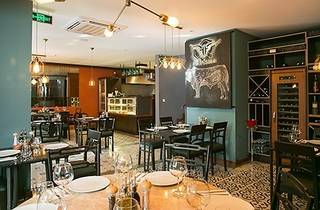 Bistecca is a brand new steakhouse that just opened up on the street behind İstinye Park. The prime location is one thing, but the restaurant’s inviting outdoor area resembling a botanical garden also works in its favor. The first item on the menu that grabs our attention is the kokoreçcooked over coal fire. This street food staple is notoriously tricky to clean, but we’ve got zero misgivings about trying Bistecca’s version: in fact, it might even be the best address for those who like their kokoreç only mildly spicy. As the image suggests, it arrives with a generous serving size and simple presentation. The burger is also noteworthy thanks to its flavorful bun, chewy with a soft, cake-like center. 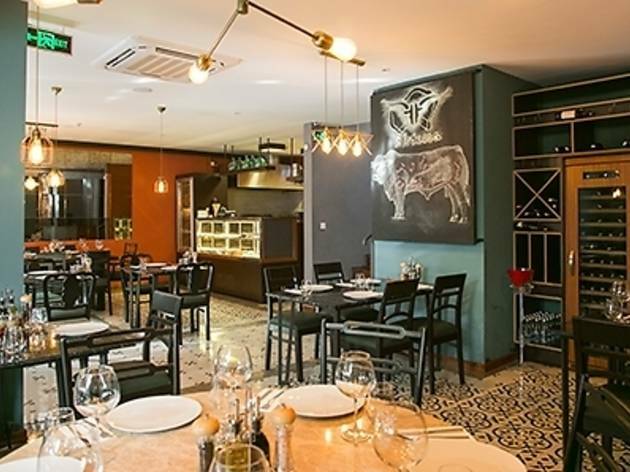 As you may already have noticed, the prices are quite reasonable at Bistecca, and even the higher-priced menu items like the t-bone steak, Bistecca Lokum and veal chops do quite well in terms of their price-performance ratio. Bistecca is also working on perfecting a recipe for meat fondue that involves a special sauce made with meat broth, but whether this will start a new food trend we’ll have to wait and see. On the dessert front, we’re also looking forward to the inclusion of the Adana-styletel kadayıf(fried, shredded wheat-like pastry) served with clotted cream made from buffalo milk on the menu soon.